Crops like tomatoes, lettuce, broccoli, peppers, eggplants, etc need warmer conditions to grow. It is hard to grow them in winter or cold conditions. Expert growers grow warm crops throughout the year by creating warm conditions for their plants. Today’s article is all about growing warm plants at any time of the year by using seedling heat mats. Read till the end to know which heat mat is best for your plants and how to use them correctly. What is a heat mat? As the name suggests this is a type of mat which releases heat. Seed mats are waterproof mats made with high-quality plastic material, having heating coils inside them. 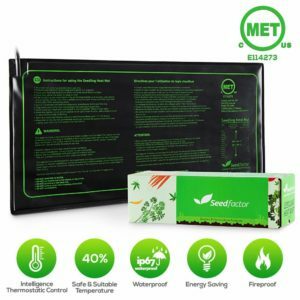 waterproof seedling heat mats are shockproof. when we plug the seed mats into the power socket by using a power cable. The inside coils heated up and start releasing the heat energy in the limited amount. Place them under your seedling try so that heat can warm the soil which gives warmth to the plant. This encourages faster growth and prevents many diseases at the initial stages of germination. In our country, we have long winters so seedling heat mats are necessary for us to grow our favorite plants under grow lights. why seed mats are important for germination? Heat mats help in the germination process, therefore, they also called germination heat mats. The purpose of their use is to make the soil temperature ideal for propagating. They keep the soil temperature at 70 F. which is best for the germination process. If the soil temperature drops down, your seed will not germinate at all. How do I know when to use heat mats for germination? When you grow plants, from seeds you will have to use heating mats. Cold weather interrupts the germination process which results in loss of seeds. We all know plants like to live in normal temperature they do not survive in cold weather. All vegetables need a certain amount of heat in the soil to grow from a single seed to a big plant. Seeds will not germinate if the soil is out of warmth means it is cold according to the outside temperature. Some vegetables need more warm soil while others need little heat. For example, eggplants need more warm conditions and tomatoes needs less heat than eggplant. There are many ways to keep the soil temperature ideal for the seedling. The least expensive way to maintain the desired temperature is heating mats. Other ways are costly which are only affordable if you are growing vegetables on large sales as farmers do in greenhouses. For hobby growers, heat mats are quite affordable and easy to use option also they are easily available and comes with the years of manufacturer warranty. Use seedling mats to make the cloning process faster. It does not matter which type of grow light you are using for seedlings heat mats make the difference in the growth rate. How many types of heat mats are available? All the germination heat mats look like a regular heat mat with a flat surface and mostly black in color. They made of heavy plastic material which protects the inside heat coils. Most of them are waterproof but it is your duty to make sure the mat you are buying is a waterproof mat. MAT SIZE: Mats come in all sizes and shapes. You can get a standard size mat to form the market which is exactly the size of a standard seedling tray. Also, available in large sizes from 6 to 10 feet long which are suitable for commercial use. In the indoor garden, we normally grow few plants and standard size is enough unless you have a plan to expand your garden. Measure the size of your tray and then select the seed mat. NOTE: Do not use large mats if you have a small tray, by doing this you will be wasting your money on large mat and electricity, heat energy. Choose large plant heat mats if you are going to use two or more trays for germination at the same time. Expert Advice: Save your money on growing equipment especially if you are a hobby grower. Choose that equipment which you really need, do not stock them for future use (who knows you leave this hobby in the future). What are the main benefits of Heat Mats? Following are the conditions when you should use a seedling mat. SAFETY: WHAT YOU SHOULD NOT USE FOR CREATING WARM ENVIRONMENT? Do not use general purpose heat mats or electric blankets for seedling they are made for other purposes. Because they are not waterproof by using them you can create a dangerous situation. If water goes inside them, they can catch fire or you can get an electric shock on touching them. Don’t play with your life it is better to spend a few bucks and get a proper germinating heat mat. Moreover, they can cook your seeds because they release a high amount of heat. The better idea is investing in seedling heat mats, use them for many years or whenever you need to germinate. If you cannot afford a seedling mat then there is another way to add little heat to the soil or growing medium. Take cardboard (any ordinary) make a box around the seed tray and add a simple incident bulb to the cardboard box. This will keep the seeds warm enough for propagation. This incident bulb is separate from your grow light bulb. Insert the temperature gauge into the soil to measure the temperature and add a timer which controls the running time of incident bulb. This technique is good but it required you to monitor the temperature gauge to avoid any sudden drop and rise in soil temperature. If you have a enough time for your plants then got for this technique otherwise choose a seedling heat mat. According to our experience in indoor gardening thermostat controllers are must to use with heat mats. Some heating mats come with them while others do not include thermo controllers in the kit. They are not costly you can buy them separately and add to your heating system. Normally seedling heat mats without thermostat raise the temperature up to 10 degrees which is good but sometimes this can go up to 20 degrees. Which is a big problem for new seeds? So, using a temperature controller is must to play safe. NOTE: Before using any temp-controller read the instructions given on the box or in the manual book. Check for the numbers of heat mats that can be safely connected with the particular device. Don’t try to plug more mats then recommended this can damage the device permanently. Warm crops are those who like to grow at high temperature than normal. They do not survive in cold conditions. If you want to grow them then make sure can maintain the suitable warm temperature for them. Normally those crops which we grow in summer season are called warm crops. But we can grow them in winters with the help of heating tools which keep the soil warm for them. What is the proper way to use a heat pad for germination? First of all, read the instruction on the seed pack to know the best time for planting them. All seed packs come with written guidelines. Take the seed pots and fill them with the potting soil. Do not use garden soil because the soil in the garden carries microorganisms which can affect the seed health and delay or destroy your seeds before germination. Potting soil is recommended to use as it is sterile and safe to use for the process. Now plant the seed into the pots at the depth of 1 to 2 inches depending upon the size of a seed. Now pot the soil over the buried seed to cover it completely. Put the seed pots into the holding try and place a heat mat onto a hard surface where it would not be disturbed. Now place the try with the seed pots onto the mat and turn it ON. 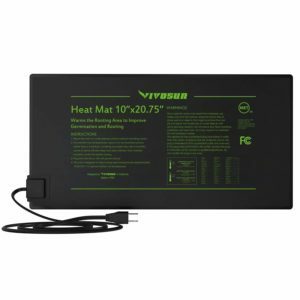 If your plant heating pad has temperature settings then set it to the 70 degrees F. If your heat pad does not have temperature control feature then buy separate temperature controller form the market and add it to the system. Some of them does not give even heat. The corners do not produce enough heat as compared to the center portion of it. Here are proven tips to reduce these kinds of common problems. There is a risk of plant burning with the use of all heating mats. To avoid your plant from getting burned place cardboard onto the mat before placing the seedling tray. The cardboard has air pockets which transfer the heat evenly to the bottom of the tray. This also reduces the risk of plant damage from high heat. Use of heat mat dries the soil quickly due to the continuous supply of heat to the soil. So, you have to look for the signs of dryness a few times a day. They come in the rolled-up packs. It is hard to make them straight. The only best way to make them completely straight is heat up them in the oven before unrolling. First of all, set your oven to the warm settings which is nearly 170 degrees. Then unpack your mat and remove all plastic covers before putting it in the oven. Do not forget to wrap it onto the foil paper (foil paper that we normally use). Keep it in the oven for 10 minutes. After the 10 minutes take it out, remove the foil wrap and unrolled it you will have the flat mat with even surface and edges. Buying a plant heating mat is easy. You need to keep a few things in your mind which are written below. High-quality heat mats are not expensive at all. Some top-selling mat does not have basic features so read the below-given checklist before buying a mat for your plant. The most important point is you need to select the waterproof mat only. Look for the exact size and shape that you need. Do not buy oversized mats they are useless unless you are going to start growing for commercial purpose. For indoor use 15 to 20-watt power is enough. Big size mats come with the power of 150 to 200 watts which is for commercial use only. Choose energy efficient mats, made of high-quality plastic material. 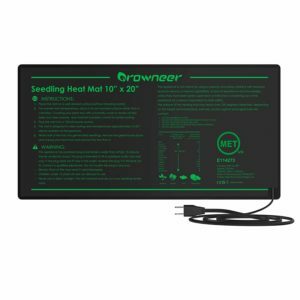 Choose such seedling heat mats which come with a thermostat. Check for the manufacturer warranty. If you choose a mat which does not come with the thermostat then check the below tips to choose the best for your mat. Choose those thermostats which come with a sensor. Which you will need to insert into the soil for temperature readings. It should display readings in both Celsius and Fahrenheit degrees to avoid the conversion calculations form one form to another. Choose single or multiple mat controlling thermostats. Those are little expensive which can control more than single heat mat. How long should I leave the heat mat on? Leave your heat mat on continuously for 24 hours a day until your seed sprout and start to pop out of the potting soil. Once they germinate remove the mat otherwise the heat will destroy your plants. Which temperature is suitable for my seeds to germinate? All seeds are different from one another. Check the seed package to see the recommended temperature settings for propagating. Which type of growing medium is best for germination? It totally depends upon your growing experience and choice. Personally, we use potting soil or sometimes Rockwool. How to clean heat mat? It is very simple, take a neat and clean cloth and clean the surface of it, no need to spread the water. If needed you can wet the cloth. Do not make a mistake of washing it with detergent or other soaps. The product is MET certified which means you do not need to worry about the ????. Keep the temperature between 70 to 85 F for effective germination. It is safe to use for indoor gardening, it constructs with the waterproof material. Use it the way you want do not worry about the spill or water it does not give shock it is ip67 certified. The manufacturer uses thick silicon heating wire for uniform heating and it also increases the durability of the seedling heat mat. Available in small size = 10”x20”, 17.5 Watts, Medium size = 20”x20”, 45 Watts and large size = 48”x20”, 100 Watts choose according to your requirements. Normally seedling mats come with ordinary power cables but this mat comes with a waterproof power cable which is thicker than ordinary wires. Having a thick power cable. You can use it in high-temperature conditions it is made for rough use. The best part is the mat is fireproof means no need to worry about the fire risk. Ordinary mats use plastic material which melts down when the temperature increases excessively. A germination mat forms the best indoor growing equipment manufacturer. If you want to buy the best grow lights, grow tents, heating mats then this is the brand which you need to choose if have a good budget. They made quality products only. This Seedling heat mat is perfect for 1020 trays you can put a slightly large tray on it. It maintains the soil temperature between 10 to 20 F which is perfect for seed starting and cloning. If we talk about the build quality then there is no doubt it is the best in the market. Designed in such a way so that plants can receive an equal amount of heat. Low-class mats release high heat in the center of the mat but this heating mat release uniform heat. Your plants at the corners get the same amount of heat as the center plants get. Alloy Nikrothal heating coils are used to spread controlled heat. Extra layers of PET film ensure the high durability of the mat. You can use it any condition and wash it with soft scrub, scrubbing will not damage the outer layer. Vivosun waterproof heating mat comes with the 1-year of warranty. Do not worry about the electrical bills this only consumes 18 watts of power which is nothing for high-class mats. If you have a dome then place it under the try you will be surprised with the magic of it. It produces lots of dew which increases the humidity which is again beneficial for plants and trigger the fastest growth. The manufacturers claim that the users report them the 100 % success in the germination, cloning. One should require a strong knowledge of germination to get 100% success in it. For excellent results use it with the humidity dome and thermostat controller. If you are not a professional indoor grower then it is suitable for you to buy a multifunction heat pad. Which you can use for other purposes also like for making yogurt. We all know yogurt making process required us to maintain the temperature of the milk at 40 degrees after adding the active culture in milk. When you want to grow plants from seeds us it under the tray and once the germination process is finished. Remove it from the tray and use it to make yogurt and brewing your Kombucha. If you are a fan of eating herbs then you will love it. It acts like magic on the herbs, it speeds up their growth rate by 50 %. We also use this mat in our office to grow basil from seeds. It is easy to grow herbs than other plants. Moreover, herbs need less maintenance than other vegetables and fruits. 1-year hassle free warranty from the manufacturer comes with 24 hours customer friendly customer service. Waterproof heat mat but do not wash it with scrub this will damage the outer layer of it. Heating coils are wrapped with the silicon. The good news is it comes with the 6feet long power cord. The polarized plug is used to ensure that users will not get an electric shock. Connect it in only the polarized outlet. If it does not fit in it contact the professional electrician. Do not modify the plug this will void the warranty and is also dangerous (increases the chance of electric shock). ipower seedling heat mat with thermostat controller set is here to make your garden greener. Above given mats do not come with a temperature controller but this comes with digital thermostat controller. Ipower is a well-known company in the field of Gardening equipment and supplies. They supply their products all over the world. Their every gardening equipment comes with a warranty the same in this case. Both the mat and thermostat come with a 1-year warranty. In the first year of use, if your thermostat or mat stops working due to a manufacturing defect, ipower will fix it free for you. The hydroponics heat pad keeps the temperature of soil 10 to 20 F degrees above the ambient room temperature. The kit includes one mat with a single thermostat. It is suitable for germination, fermentation and home brewing. Hydroponic heat pad provides constant optimal temperature to the seedling tray. Easy to use technology just plug it in the power socket and it will start working the right way. Excellent design, easy to clean and use. ipower means highly durable products. Internal insulated wiring for maximum safety. ipower heat mat controller provides full control over the temperature. You can set the germination temperature according to your growing environment. It gives a digital reading which you can read in Fahrenheit Celsius. Two white color buttons are given to adjust the releasing temperature (adjust it up and down). Just plug it and use it. It controls the temperature between 40 to 108 degrees Fahrenheit whereas display range is 32 to 108 F.
Another vivosun product but this comes with the thermostat controller. We have already explained about the vivosun heating pad in an above-mentioned mat. The mat is flexible enough that you can use it at any place. But we advise you not to put your mat on the wet surface this can cause damage it. It does not matter which mat you are using never ever put it under the direct sunlight. Moreover, while germination does not use grow lights with the heating mat. This can increase the temperature inside the humidity dome which can damage the seedlings permanently. In germination do not put your seedling tray under the grow light if you are using heating pads. Vivosun mat also comes with the vivosun heat controller thermostat. The controller keeps the constant temperature between 65 to 108 F for best results. The sensor probes are designed in such a way so they can deliver accurate readings. Read the thermostat controller manual before operating it. The controller is compatible with all types of heat mats. If you have heat mats form other manufacturer but do not have a controller you can use this controller with them. It is made with extra-fortified plastic which is high-quality plastic which can handle extreme wear and tear. Clear display to read temperature reading, superior quality power cable, and plug. You can easily install the thermostat on walls, with hooks, etc. You can set the temperature in Fahrenheit and Celsius whenever you want. All the above-given mats are the best seedling heat mats in Canada. You can choose any size according to the size of your seedling tray. There are other heating mats available in the market which are not mentioned here. This does not mean they are not good seedling mats you can use them but above-given brands are top manufacturers of heating mats and other gardening equipment. If you are using a mat which is not listed above and you want to us to add it into the list mail us the details. We can review it and add it into tour list to make it best for our readers.